Bruce Jackson is always looking for that moment in nature when the elements come together to offer divine beauty in its most expressive form. Fall colors, flowers, sunrises, sunsets, winter scenes—his goal is to merge the creative process with these moments of perfection, honoring the sacredness in nature. Bruce premiers six new releases for this exhibit. 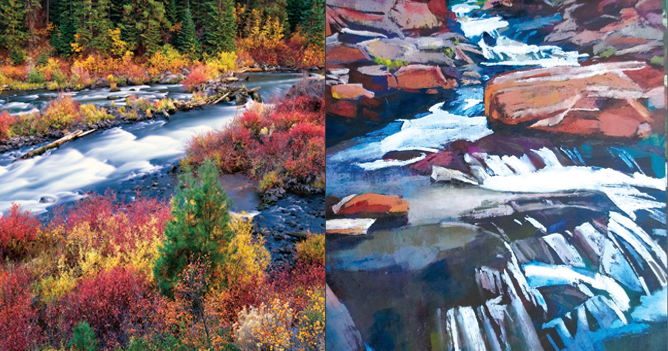 Tracy Leagjeld’s vibrant monotypes of the Oregon wilderness have become her trademark. She creates spare landscapes where every mark carries the message of light or shade with rich color. Inks are painted on each plate with brayers and hand rubbed transferring onto paper or board. Finished pieces have a richness that captures the essence and spirit of a landscape.